A gory video shows the moment a suspected hitman crept up to a man and his baby mama in a public space in broad daylight and began firing shots into him even after the man was down. 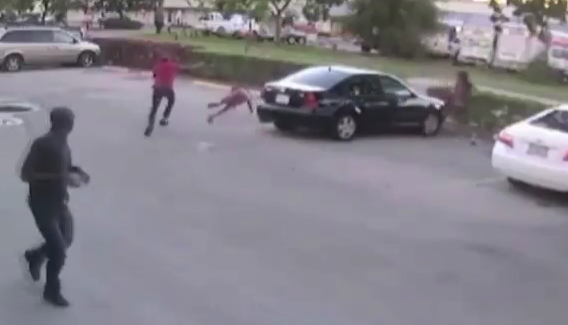 In the footage, a passerby can be seen running to safety as the attack continued, while the victim’s baby mama ran around, confused, unsure whether to stay with her man or run off. She eventually took off and that was a lucky move because soon after, the gunman turned and aimed the gun at the woman, shooting twice, but she was far enough to escape unhurt. Soon as he left, the woman got up from where she hid a few feet away and took off. The attack which happened in Lauderhill, Florida, USA, was caught on CCTV. The victim was identified as 34-year-old Gary Wallock. After killing him, the hitman escaped in a blue Nissan Altima, believed to be driven by an accomplice. The police believe the shooter is 26-year-old Trace Obrian Walker.